August 8, 2018 By Ali M.
With the English top-flight kick-off right around the corner, here's everything you need to know to follow the exciting league. When does the Premier League start? The English top-flight kicks off on August 10 with Man United vs Leicester City. They are Man City. Guardiola's men conquered England in emphatic style last season, winning the title with a staggering 19-point gap ahead of second-placed Man United. The Citizens also made history along the way, setting several records. They are: most points (100), most wins (32), most away wins (16), most goals (106), most consecutive league wins (18), highest goal difference (+79), fewest minutes behind in matches (153 minutes) and biggest winning points margin (19). Which teams are playing in the Premier League? What are the key fixtures of the Premier League? What are the Premier League broadcasting channels (TV, online streaming, and on-demand)? TV: NBC, NBCSN, and CNBC are English-language options while the subscription-based NBC Sports Gold will give access to three matches per week/round. UNIVERSO and Telemundo are Spanish kanguage TV channel options. 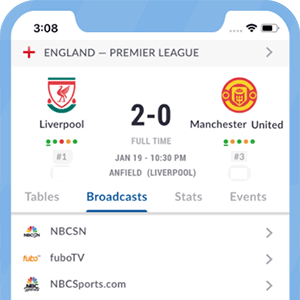 Online streaming: NBC Sports App and NBCSports.com are English language streaming options on mobile while Telemundo Deportes En Vivo and Universo Now are the Spanish language streaming options. On-demand: fuboTV is an option to watch games live and on demand. TV: TSN and Sportsnet are the channels to go to for the Premier League.